Upstarts are starting up everywhere. In fact, it’s practically impossible to stay on top of all the new distilleries popping up across the states. When it comes to whiskey, there are two common routes for upstarts to bring product to market. The first is sourcing whiskey from elsewhere and finishing it, blending it, or simply bottling it. The second is focusing first on white whiskey or young whiskies that do not age long, often employing techniques like the usage of small barrels or the insertion of wood staves to help impart the characteristics more typical of an older spirit. A friend of mine happened to share a few bottles from Colorado’s new Distillery 291, based out of Colorado Springs and just over a year old. This distillery is focusing on the second approach detailed above – distilling their own whiskey, but keeping the aging to a minimum for now. Distillery 291 is run by Michael Myers, a successful photographer who was born and raised in Atlanta, made his home in New York, then moved to Colorado. Myers actually had Distillery 291’s copper still fabricated using copper photogravure plates that he had used previously for fine art photography. Very cool. The two whiskeys from Distillery 291 that I tried were both quite interesting, but both clearly young spirits. 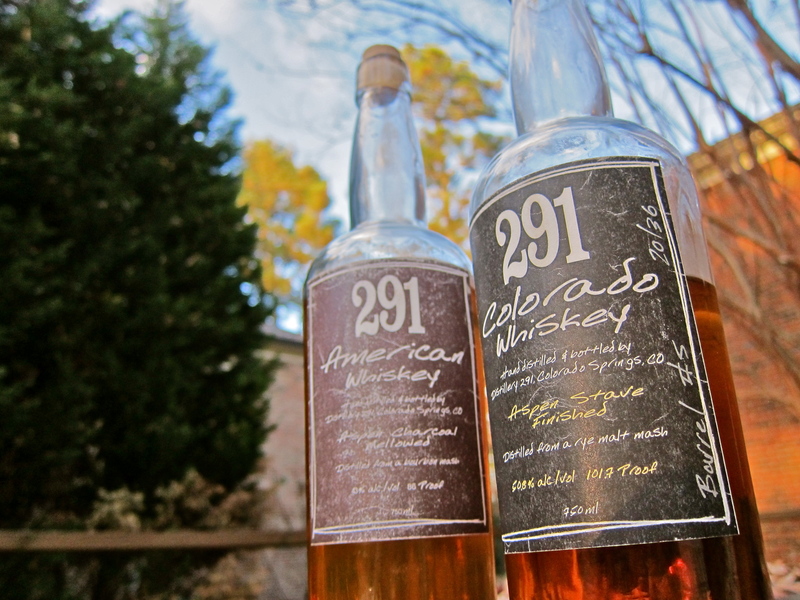 291 Colorado Whiskey is distilled from a rye malt mash, then finished with aspen staves. It has a really nice nose that brings to mind cedar and nutmeg, with candied orange peel, and a touch of mint. I’m guessing the aspen is responsible for those cedar-like notes. At less than two years old (as labeled), the whiskey comes across as a bit harsh on the palate, with a sharply assertive finish. Water softens things up – it is 102 proof – but I think the nose suffers as you add water to the bottle strength whiskey. Likewise, the 291 American Whiskey comes across, as expected, as very young. It is distilled from a bourbon mash, then mellowed with aspen charcoal. The result is a nose that speaks strongly of green corn and petrol, with a bit of marzipan. It’s long and hot, with sharp green wood and a hint of mellow caramel in the background. I’ve got to say that these are not my preferred style of whiskey – I’m not too fond of young ones. That said, I see a lot of potential here, and the nose alone on the 291 Colorado Whiskey is enough to draw serious attention. I give the American Whiskey a rating of Fair, and the Colorado Whiskey earns a Good Stuff. 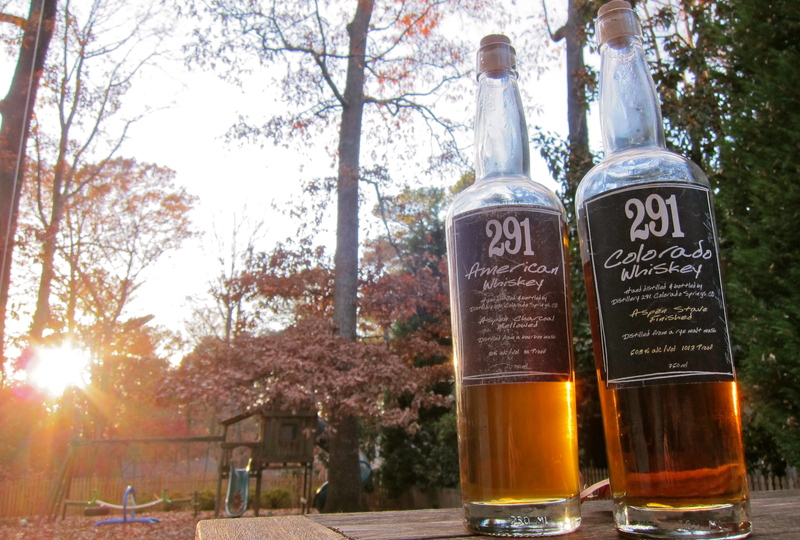 * The 291 Colorado Whiskey certainly shows great promise, but, for my tastes, needs more time in a barrel to better integrate and develop a more harmonious profile. The use of aspen wood looks to be a unique and compelling calling card for Distillery 291 with more time. I should point out that a much more experienced whiskey palate than mine has given some great props to Distillery 291. Jim Murray recently rated several of their products, and gave very strong marks to 291’s Colorado Rye Whiskey White Dog (which I haven’t tried), indicating that there’s good potential in what’s coming out of that copper still – “matured for less than one week… The way a white dog should be: pulling at the leash and baring its teeth. Excellent spices.” Murray also awarded 291’s Colorado Whiskey with 94 points (this is the same whiskey that I tasted, though Murray tasted from a different barrel) saying, “It’s a superb, enigmatic rye whiskey which ticks every box: They are obviously fast learners.” I’m eager to see where Distillery 291 goes from here. – Aspen is most closely related to the Cottonwood (they both members of the same genus, Populus), and in the same family as Willows. By itself, it’s not a distinctively aromatic wood. It doesn’t even have a terribly distinctive smell when burned. – Aspen is used for small-animal bedding, like for rabbits and gerbils. This is because cedar and pine shavings DO contain aromatics, which can wreak havoc on animals’ respiratory systems. If I had to guess, I’d say the aspen staves contribute mostly color and maybe a small amount of wood sugars and aromatics to the finished product. The mint note, in fact, is more likely to be attributable to the aspen than the cedar you detected. Poplar and willow trees contain salicylates (from which aspirin was originally derived) – one of them, methyl salicylate, is what you’d recognize as a wintergreen flavor. Jason, thanks for the comments! Very interesting. The color of the whiskey comes from the charred American White Oak barrel. In regards to the Aspen, the staves are toasted which could add color but does not contribute much if any color because by the time the whiskey is put on the staves it already has it’s beautiful red hue. How the Aspen adds to/changes the flavor is it pushes the traditional carmel note to a maple note… not sure where the mint note came from as the only person so far to detect a mint note was “thirsty south” out of thousands tasting. People who are from/spent a lot of time in Colorado say the taste reminds them of something very comfortably familiar… I attribute the memory to many cool Colorado night around Aspen fires. I wish you did visit when you were in the Springs… come by next time for a taste. My son got a bottle of 291 Aspen Finished for Christmas and it was excellent. I think you need to age it longer and see where it goes. Skies the limit and it would take it over the top.